EPA-registered Splish Splash’s One-Step Disinfectant features a clear and odorless formula with no artificial dyes. Clean and disinfect your salon with just one product. 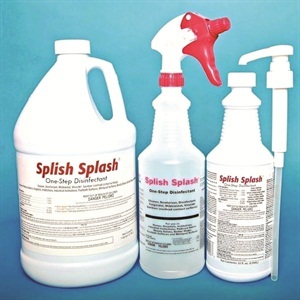 EPA-registered Splish Splash’s One-Step Disinfectant features a clear and odorless formula with no artificial dyes. One-Step Disinfectant kills bacteria and viruses such as HIV-1, Hepatitis B and C, MRSA, Influenza A, Staphylococcus, Klebsiella Pneumonia, E-Coli, Salmonella and others. > For pedicure spas and tubs, add 1 fl. oz. of disinfectant for every gallon of water. Let water circulate for 10 minutes. Drain and rinse with clean water. > For tool disinfection, mix 1 fl. oz. of disinfectant in one gallon of water. Let tools soak for 10 minutes. Remove tools from solution. Rinse and dry. > For hard non-porous surfaces throughout the salon, including manicure stations and countertops, dilute 1 fl. oz. of disinfectant in one gallon of water. For a spray bottle, dilute 1/4 fl. oz. in 32 oz. of water. Sponge or spray on, wait 10 minutes and wipe dry. > For plastic instruments, mix 1 fl. oz. of disinfectant in one gallon of water and fill your sanitation jars. Plastic instruments may remain immersed until ready for use. For more information, go to www.splishsplashcleaners.com.